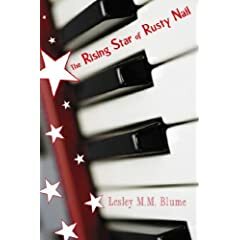 The wonderful cover shot is what drew me to this book, The Rising Star of Rusty Nail by Lesley M. M. Blume. Then the story itself did all the rest. Franny Hansen and her friend Sandy ARE what is happening in small Rusty Nail, Minnesota. Besides being a prankster, Franny is a genius piano player, just ask her. In the small town there is also another budding piano star, Nancy. (Prancy Nancy) Franny thinks she has found her ticket out of Rusty Nail when she participates in what turns out as a piano-off with Nancy in front of the governor's wife. As it turns out, the governor's wife could have cared less. Next comes the mysterious Olga Malenkov, whom everyone in the town believes to be a "commie" but who turns out to be a famous piano player. Is Olga a communist? Does she help Franny with her piano playing? Will anything come of any of this? That you will have to read to find out. What I loved about this book also drove me crazy! It is set in 1953-54 and as such contains lots of history. Yet, I am not sure all of the book would be considered historically accurate. I spent a lot of time while reading Googling facts. Most turned up pretty accurate, except some of the McCarthy references. I also could not get over the fact that Franny constantly called her mother and father by their first name. WHAT? Not many kids would do this and ESPECIALLY NOT IN 1953! I guess Ms. Blume could have been trying to evoke the feeling that this family was anything but traditional, but that is really unnecessary once you have met the characters. In some spots the dialect was strange. Minnesota does not elicit thoughts of country twang to me, but that is often what came up in the middle of nowhere. I thought the story was a bit long in places and may not be able to hold the attention of one of my students. On the other hand, I did love the way the book was divided into three parts. I thought the characters were very well developed. I could not stop reading because of the suspense brought forth in the plot. I was completely satisfied with the ending. I am not really one to be upset about a book's historical inaccuracy when it is a fiction book to begin with. (I just felt I needed to point them out for anyone who that really matters to.) I am quite excited to see what else Lesley M.M. Blume has in store for her readers. Her newest book Tennyson sounds like a winner. I've never heard of this Blume. I am intrigued by her wide variety of settings. Thanks for the review. I think this is one that I might have to pick up. thanks for sharing! I read this book this summer, and while I liked it, I didn't love it. I think I found the Russian piano player to be slightly unlikeable. I love reading other opinions, though. Thanks for a great review!